Choose your desktop first. We offer a diverse range of desktop materials and colors to fit your style. Need help? Give us a call! Our 1" thick Laminate desktops are GREENGUARD-Certified and come in black, white, cherry, ash gray, walnut, or maple wood grain finishes. Our 1" thick Bamboo desktops are available in a variety of sizes and shapes, including the option of getting one with a center cutout with an ergo edge. Rubberwood is an environmentally friendly wood harvested from retired Hevea brasiliensis trees. The lumber is very durable and makes for a solid wood desktop that won't break or warp. The 13/16" thick Rubberwood Desktop is available in a natural, dark brown, or light brown finish. All three finishes feature striking wood grain characteristics. The natural finish is the lighter of the three and makes for a soft, eye-pleasing desktop. Dark Brown is striking and closer to a chocolate brown. The light brown finish is a shade lighter on the wood color spectrum, while still being a light and refreshing color choice. Reclaimed Wood desktops are constructed out of reclaimed solid Douglas Fir or Teak and are available in several sizes to suit you workspace. Handcrafted to perfection by our expert woodworker, our Solid Wood desks are used to getting this amount of attention. All woods will use filler to fill in knots, bug holes, or imperfections in the wood. The filler is usually black, but other colors may be used at the woodworker's discretion. If you need a desk in a unique size, just contact us for a custom quote. Please note that cedar is a fairly soft wood, and applied pressure can leave indentations. The UPLIFT Four-Leg Adjustable-Height Standing Desk is 30" deep and available in several different widths: 60", 72", and 80". Choose the size that lets you work within your Neutral Reach Zone. Your keyboard and mouse should be located in this zone, reachable with your upper arms at rest alongside your body. Naturally, keep other items you need close at hand and use often in this area, like your smartphone. This zone is the area that you can reach with your arms at full extension while still seated. Devices that aren't used as often, like an office phone or task light should be placed in this zone. This area can only be reached by leaning over the desk itself or getting out of the chair or both. Things that aren't used very often, like books, monitor stands, external hard drives and decor should be placed in this zone. A note about 4-leg desks and acoustic privacy panels: If you plan to add a privacy panel to the back of your desk, please be advised that it will not fit fully on the back and flush with the desktop. We recommend adding a Desktop Acoustic Privacy Panel Holder to your order if you wish to set your panels at the rear of your desk. If you're interested in installing a monitor arm to the back of your 4-leg desk, go right ahead. In order to do this you will need to remove the desk frame's center rail. The Horizon Monitor Arm will lift heavy monitors weighing over 9 lbs with ease. The built-in gas cylinder located within the arm puts pneumatic height adjustment within reach. The adjustment capabilities don't stop there, rotate, tilt, and pan your monitor to find the most suitable configuration for your viewing pleasure. When you have not one but two monitors over 9 lbs that need lifting, turn to the Horizon Dual Monitor Arm. Rotate, tilt, and pan each monitor to find the perfect viewing position while you work. The built-in cable-management system located on the arms and base will help cut down on workspace clutter. A quick note about our metallic (industrial style) frames: Our metallic (industrial style) frame finish varies slightly in color. This is a normal consequence of the finishing process that we use that lets the natural look of metal show through. The end result can vary from a raw and etched metallic to a darker shade of industrial metal. Enjoy the benefits of using a standing desk, like the ability to sit in a more ergo-friendly postures for your body, ideally with your keyboard and mouse close to your lap or within your Neutral Reach Zone. This is different for everyone, but UPLIFT's height range of 23.5'' - 49'' means that it will work for 99% of the population! Note: Installation requires a device running a minimum of Android 4.3 or iOS 8.0 and access to the phone's camera (to scan QR code). Version 1.11 and later is compatible with Android 9 Pie. The Large Half Circle Desk Drawer is the easy way to store small desk items and keep your desktop clear of excess clutter. This storage accessory has enough room for your writing utensils, paper clips, and sticky notes. Keep everything you need right at your fingertips. These useful storage solutions integrate seamlessly into your UPLIFT Desk and swivel centrally, allowing you to access it from either side. Preserve the clean, open design of your desk with this handy accessory. Both drawers come in black and white color options to match your desk and accessories in all the right ways. Open up your desk up to more storage possibilities with the Locking Under Desk Drawer. This compact storage compartment features a sliding drawer and a padded shelf. The 12" x 12" drawer will house laptops, purses, or any other valuables. Choose between black, gray, or white powder coated finishes to match the color scheme of your UPLIFT Desk. For a sturdy storage solution that is always by your side, look no further than the Hanging Storage Cubby. The cubby features a large shelf below and a small storage compartment above for open-concept storage that will free up some desk real estate. Both shelves are padded to protect your valuables, and sturdy steel construction will safeguard up to 50 pound of whatever you need to stow away. Available in black, gray, and white to match the frame on your desk. Increase the storage capabilities of your desk without adding bulk with the Slim Under Desk Storage Drawer. This steel, locking drawer comes in a black, gray, or white powder-coated paint finish. Mount the drawer to the underside of your desk by using four wood screws to hold it in place. Optional brackets are included for the ability to add a shelf above the locking drawer. Lock away your valuables for peace of mind while you are away from your desk with the Slim Under Desk Storage Drawer. 60x30 > 60" x 30"
Local and globally sourced parts are assembled and shipped from Austin, Texas; designed in the U.S.A.
Douglas Fir Reclaimed Wood Desktop. Click here to customize the desk above. If the air in your area is especially dry, your wood desktop could be at increased risk of cracking and splitting. Wood naturally expands and contracts depending on the amount of moisture in the environment, and without enough humidity, the moisture in your desk can evaporate, leaving it vulnerable to warping. It's a completely natural process, but it's unfortunately something that could affect your new wood desktop. If your desktop does crack or split, we're happy to send you a repair kit to fill the affected areas. If potentially repairing your wood desktop isn't something you're comfortable with, we recommend that you take a look at our Bamboo, Eco, or Laminate desktops instead. If your desktop has already warped, please click here for instructions on using our solid wood desktop repair kit. I have the advanced keypad with memory presets, and when I try to use one of the presets, my desk only moves a little bit and doesn't go to my preset height. Is there something wrong with my keypad? Do I have the newest frame? 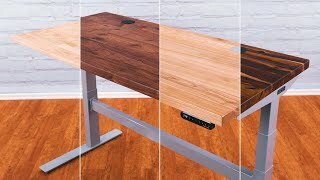 UPLIFT Desk started shipping their newest 4-leg desk in all colors early 2018. The new design has a smarter control box and comes with crossbars that are designed to stabilize heavier desktops. If you have any questions about your desk or want to know how you can upgrade yours to have the newest features, reach out to our Support Team and we'd be happy to help. How do I tell which control box I have? Take a peek at the silver label on you control box - if that sticker says v4.1, v4.2, or v4.3, you have our newest control box, which comes with a new features! What features are on the version 4 control boxes? You'll love the version 4 control boxes because they come with new safety features: Keypad Lockout and Collision Sensitivity. Collision Sensitivity allows users to set the sensitivity for their desks to one of three levels, so when adjusting for height, the desk stops when it touches an object instead of continuing to go up or down, which can knock things over and cause accidents. Keypad Lockout lets you keep unwanted hands from adjusting your workstation when the feature is activated. And users will now be able to switch quickly between One-Touch and Constant-Touch modes, in addition to being able to toggle between inches and centimeters. Do I need a crossbar on my desk? Yes, if you use the standard crossbar rail assembly. Is there any benefit working at a desk with four legs versus two? Our 4-leg frames are some of the strongest on the market, and are capable of lifting a full 530 pounds! If your workstation consists of multiple monitors and computers, this desk might be your best bet. By comparison, the 2-Leg frame has a carrying capacity of 355 pounds, which is still suitable for most people. If I want more support, can I add more legs to my desk? At this time, we cannot add more legs to your desk. Every 4-Leg Desk uses two control boxes to synchronize the movement of all four legs. Since there is only one port to connect the two control boxes, and there is no way to add a third box in order to support two more legs. Can I use this desk if I live outside of the United States with my country's outlets and voltage? All of our desks are designed to run on the US electricity standard of 120V. This means if you're ordering an UPLIFT Desk from outside the United States (excluding Canada), you'll most likely need to plug your desk into a step down transformer before plugging it into a wall, otherwise you run the risk of overloading your desk's control box, which is not covered by warranty. Reach out to our support team if you have any questions regarding this subject. What is the deal with your three-stage frames? Our 4-leg desk frames are three-stage versus the traditional two-stage desk on the market today, which means our desks are 33% faster thanks to 3 spindles in each leg instead of 2. This means you have a higher adjustability range so desks fit shorter users and kids, even very tall users or those who plan on adding a treadmill to their setups later. How many motors are in the frame? All UPLIFT Desks boast a motor in each leg, so in this case, four motors. This makes UPLIFT Desks quieter when raising and lowering, safer, stronger, and more reliable than desks that work with fewer motors. How difficult is it to connect all of the legs? Our 4-Leg Desks are as simple to assemble as our 2-Leg Desks, you will only have to route more a few more connecting wires between all four of the desk's legs. Is a 4-Leg Desk better than a 2-Leg Desk? Our 4-Leg Desk provides additional lifting capability and more stability for heavier work setups, but most users will find our 2-Leg Desk to be ideal if you work with a traditional amount of computer gear. The UPLIFT 4-Leg Desk can hold up to 530 pounds. What kind of activities would this desk be good for? We advise purchasing the 4-Leg Desk if you have a lot of heavy equipment or computer gear on your desk that might exceed the weight capacity of a 2-Leg Desk. Music equipment, quilting machines, and quad monitors are a few examples of heavier items that might work better with a 4-Leg Desk. How many people will I need to put my desk together? We recommend using two people when assembling the 4-Leg desk, due to the steps that require you to flip the desk over. They can also help you attach the legs to the desk quicker! How loud is this desk when I raise and lower it? The UPLIFT 4-Leg Desk transmits 50 decibels of sound during motion. To give you an idea, this sound falls somewhere in between a refrigerator and a computer. I've assembled my desk but it won't move when I try to raise and lower it. What's going on? First, check is that all of your wires are properly connected from your legs to the control box. If any of the legs wires are not properly connected, the entire desk will not function. Most problems after assembly are quickly fixed by doing this. If you continue to have trouble, contact us and we can help you get moving! If my desk breaks within the warranty period, will you send someone out to repair it or ship me a new desk? If your desk breaks within the next 7 years, we will send you replacement parts at no cost to you and walk you through the re-installation steps over the phone. We do not send technicians out to service or fix our desks. Why are the lead times so much longer on the solid wood desktops? Our Solid Wood Desktops are made-to-order after each order is placed. The lengthy lead time allows for the lumber to be cut, fashioned, finished, cured, and crafted into a luxurious desktop before being shipped to you. What is the difference between 1" thick bamboo and premium bamboo desktops? Our 1" Thick Bamboo Desktop is made from UV-cured bamboo and is available in stock for quick shipment. By comparison, our premium bamboo is 1.5" thick and is custom-made by our expert woodworkers when you place your order. Our desktops also feature carbonized bamboo, which gives them an alluring honey-caramel color that you're sure to love. Our Reclaimed Wood Desktops are handcrafted from Douglas fir or Teak salvaged from old building sites. This lumber has had a lifetime to harden and comes with subtle features in each piece, giving you an upcycled desktop that's more eco-friendly than newly harvested solid wood. How much height will casters add to my desk? UPLIFT casters will add 1.5 inches of height to your desk. This is ideal for taller users! What is the difference between Eco and Laminate desktops? Our Eco Desktop is constructed from 100% recycled wood MDF that has been powder-coated for a seamless finish that's more scratch resistant than Laminate tops. The Laminate desktop is made from multiple layers that have been treated under extremely high pressure, comes with a band around the edge, and is not seamless. Laminate desktops are more resistant to spills and moisture.